Carl Frampton (23-0, 14KO) produced the performance of his life to outpoint Leo Santa Cruz (32-1-1, 18KO) - winning the World Boxing Association title to become a two-weight world champion. The judges scored the contest 114-114, 116-112, 117-111, with the majority of boxing experts favouring Frampton by a close decision. After four stanzas, the Irish challenger asserted his dominance with an exclamation mark as he staggered Santa Cruz with a stabbing overhand right towards the end of the second. He then continued his excellent work - at moments initiating the action with a stiff jab upstairs followed by crisp hooks to the body before Santa Cruz, while occasionally clipped Frampton entering close range, conceded shots inside the pocket and lost the round. While Santa Cruz began to land sharp combinations to the head, it very much remained a fight in control of Frampton who operated with an excellent jab - useful in setting up attacks and leading to keep attacks at bay - as he secured the fifth with a superior defence and head movement to evade a vast amount of Santa Cruz's offense. Having said that, despite jabbing to keep Santa Cruz at his preferable mid-range, Frampton's defence unravelled in the sixth, seventh and eighth rounds as the efficient workrate of the champion sprung him back into contention as valid arguments were made to suggest the contest was level heading into the later rounds. 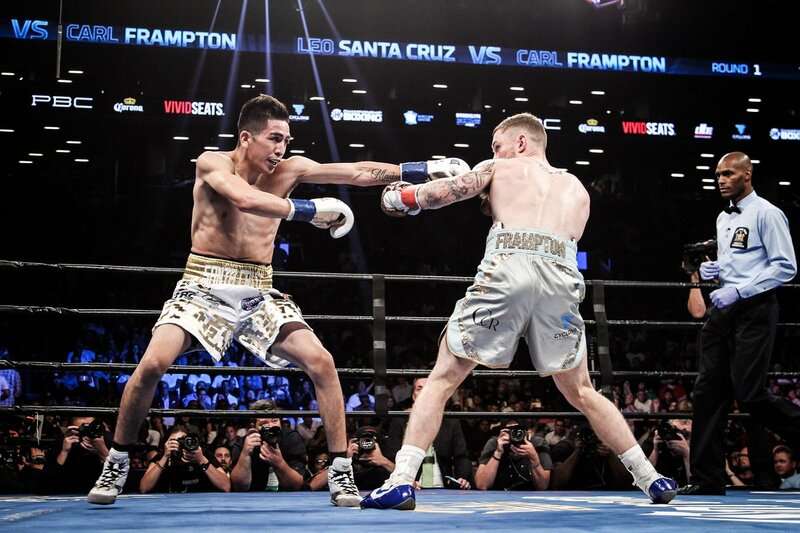 In an enthralling battle, Santa Cruz and Frampton perhaps fought on emotion rather than brains, as a firestorm erupted in the centre of the ring with both fighters establishing successful bursts but also conceding points which emphasised how close it truly was. In many ways, the superior boxer Frampton succumbed to a toe-to-toe war with the aggressive, Santa Cruz - who enjoys stand up wars despite possessing a height/reach advantage over smaller men that would usually see lankier fighters like him box at long range. He didn't, and the fight became an erratic plea to seize supremacy, often seeing the tireder Frampton make minor defensive errors with the gradual decrease in his stamina. At that stage, Santa Cruz sent him backpedalling with a stinging straight right at the beginning of the 11th which saw the reigning champion seal another round. At times, Frampton didn't only outbox Santa Cruz, but he partially stifled his relentless workrate that can culminate in 100 punches being thrown per round. Frampton earned his respect by hurting him in the second, and subsequently landing hard power punches. Both men met in the middle once again, to conclude the contest, laying it all on the line in the dying stages of a terrific fight. Santa Cruz nailed Frampton, then the challenger hit back, then the champion mixed it up with a 3/4 punch combination which Frampton occasionally evaded. It had everything. A mix of elite skills, fighting heart, smart tactics and a raucous crowd to gift the boxing fans with a fight of the year candidate. At ringside, Barry McGuigan was in tears of joy as the title he held between 1985-86, was captured once again by a fellow Irishman Carl Frampton. A defining fight in the career of Carl Frampton MBE, who remains undefeated and becomes a two-weight world champion, overseas, against the odds.